This post is by Expedition Team Member Jennifer Boulay. The idea for this blog hit me during one of our dives and I wrote this down on my slate. So here it is literally from the reefs of Phoenix Island to you. I am a PhD student at Penn State studying coral genetics and my work here is like being on a television crime drama. In reality, my work is much cooler. 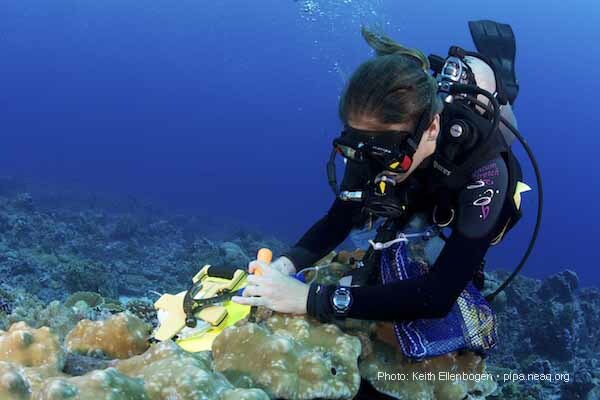 Instead of a dirty crime scene, I get to be here on the beautiful reefs of the Phoenix Islands and instead of taking samples from a dead body, I take small samples of coral tissue under the water. But back in the lab, I do get to use information in DNA to solve a mystery: How far do PIPA corals move within and among PIPA islands and the other Pacific archipelagos? 1) A coral colony can release sperm, eggs, or sometimes both into the water and mate with other colonies of the same species. This is how corals sexually reproduce. The resulting larvae can travel in the water on currents to other reefs or stay locally and settle back on the same reef. For these sexually produced colonies, their genetic signatures allow us to model patterns of connection among reefs. This will tell us if the colonies were locally produced or if coral larvae from one island make it to other islands within PIPA or even the other islands of the Pacific. My lab has been working on reef connectivity across the entire Pacific in one species of coral. 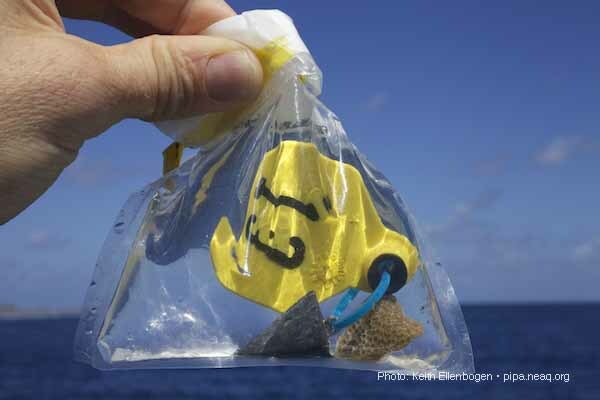 In fact, the first samples I ever analyzed during my PhD were sent to my lab by Randi Rotjan from Enderbury on the PIPA expedition in 2009. So the Phoenix Islands are especially close to my heart and I am so excited to be here and experience them with my own eyes. But this year, I am collecting samples from all the islands and will be able to look at connectivity within PIPA in addition to the connections among the PIPA islands and other Pacific Islands. 2) Another way a new coral can establish on the reef is from an existing colony. A piece or branch of a coral colony can break off and become a new colony. This is known as asexual reproduction by fragmentation. Think of your garden at home. Even though corals are animals they reproduce somewhat like plants. You can take a cutting of a tree, plant it in the ground, and it will grow into a new tree. But this new tree is a genetic clone of the original plant from which you took a cutting. These two plants will share the exact same DNA. In my lab at Penn State I will use 11 sites in the DNA to give each coral a unique identifier, its genotype. If two samples have the same genotype those colonies are clones of each other. For branching colonies it is easier to understand how a branch can break off in a storm for example and become a new colony but many of the corals on the reef just look like rocks or even grow encrusting on the surface. For these colonies it is possible that fish bite the coral, not to eat it but to get at other things living inside the corals like mussels or worms. The coral pieces that are broken off might establish their own colonies nearby. The 2012 PIPA expedition is the optimal way to study this unique method of asexual propagation because we have scientists collecting data on fish assemblage and corals at the same time. Unlike in TV, my results are not completed in one, neat, 30-minute episode, so STAY TUNED.